In episode 10 I have the great pleasure of speaking to Jools Murray. Jools started playing Ultimate in 2002 and has played with many club and GB teams since. Jools studied S&C at Bath and is currently doing a Masters in Strength & Conditioning and working with England Institute of Sport. We discuss strength and conditioning for Ultimate, both to minimise injury and maximise performance. 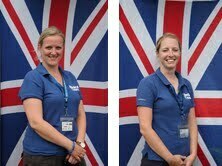 In this episode I am delighted to be speaking to Angela George & Laura Partridge, two of the wonderful physio's who look after us at tournaments and also work closely with the GB teams.